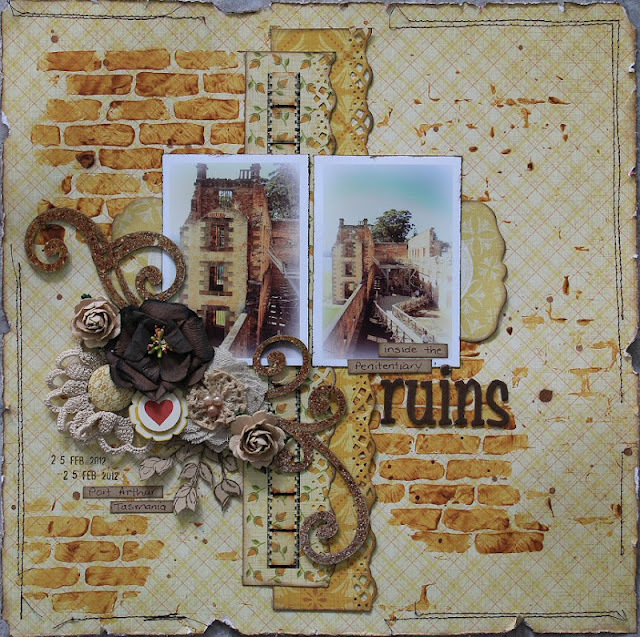 Hello again everyone...I'm back again to share another layout I've created using my August DT kit from Handmade by Suzanne, which features Cosmo Cricket's "Tea for Two" papers & embellishments plus some 2crafty chipboard. And here is my layout....again, nothing to do with tea! Which shows just how versatile this fab range is...you can create just about any themed layout with it! Inside the Penitentiary ruins - Using Rose Petal Jam PP as my background, with some CW mini bricks template work using texture paste mixed with Mr Huey's Pumpkin spice mist....with a few punched strips of Butter & Cup & Saucer PP's. The 2crafty chipboard piece is one of the Ruby's Swirls that I have cut into a few pieces & arranged at different angles to suit the sketch & cluster. It has been gesso'd, then misted in a few different coloured mists to give a bit of a mottled rustic effect. Here you can see the photos of inside the ruins a bit better...and my cluster using Manor House Creations & Prima flowers....and also one of the stickers from the Stacked Sticker pack. A close up of the mini bricks template work. This should win something, or make it into SBM...my new fave - it just all flows so seamlessly together & your brick bg is amazing:):):) I guess you've used Picasa on those photos...they looks great!!! Love the work on the mini-bricks. The chipboard treatments looks great too. Even more gorgeous after seeing the close-ups Linda. The brick work stencilling is fantastic. Beautiful embellishments. love these 'ruins' :) awesome textures and colors! Wow!!! Look at these colors!! I love the cluster and the bricks look fantastic!GREAT job Linda!!! Gorgeous Linda!! Love the rustic colors!! Linda I am always amazed by your use of natural colors, how beautifully all of this blends together..so gorgeous!! You did an amazing job with that paper range, just awesome! Lovin the chippy you used, too! I'm so glad I'm now a follower of yours because I really love the way you put a page together and I, like Kelly, love the natural colours on this layout. Wow. Love this to bits! Stunning!!! Congratulations Linda. Your layout was one of the "featured" layouts for the August Sketch Challenge at C'est Magnifique. We love the amazing background you created and the very interesting photos you used. Thanks for participating. Hope to see another layout from you in September.